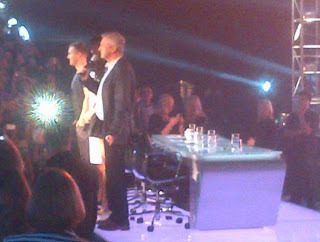 Woo, so today we went to the Xfactor auditions in Manchester. Wow, what a crazy day! So basically the tickets are free but it's first come first served so you need to be there super early. We arrive just before 8am and FINALLY got in bout 11am. Thankfully we were right at the front of the queue so things were constantly going on around us. We saw a lot of contestants being interviewed by random crew members and saw a few getting interviewed by Dermot. Me and Derm are best mates now though, we has a right good chin wag, he is really nice and actually wanted to talk to people rather than being rude like some celebs. I wish my teeth weren't so prominent in this photo, but what can you do! 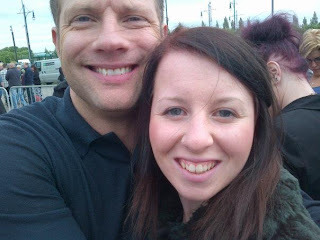 Yes Dermot gave me a hug! Moving on, everyone was excited to see who the guest judge was and all very unsure if Garry Barlow would be there cos of the Jubilee shindig last night. But he made it to Manchester in time for me to see him, and make my Mum VERY jealous. And the guest judge was Mel B which I was excited about, as I was a die hard Spice Girls fan, oh yeahhh. We were told before hand not to take camera's so I obviously didn't take mine, hence the awful mobile photos. I'm a little disappointed I didn't get better photos as we were REALLY close to the front, but never mind. We saw some really good acts, and some not as good ones. But I do think we'll have seen at least one act that gets through to the live shows. The groups surprisingly were really fab, so I may be rooting for them this year. Oh and it's so true when they say people sound differently live than what they do in real life, it'll be really interesting to see the auditions on ITV in August! I hope they managed to get me singing along to a few acts! Hope you had a fab day!